After a long game, you begin to understand that the chat is not as convenient as it seemed at first glance. If you often use it then you probably had situations when you need to duplicate a message or use autocomplete. This addon adds three useful buttons located in the chat panel that does not create difficulties in use. With these buttons, you can select previous messages using the up and down arrows. The third button allows you to use autocomplete. All three buttons look great and if you have never seen the chat, then you will not even notice the differences. 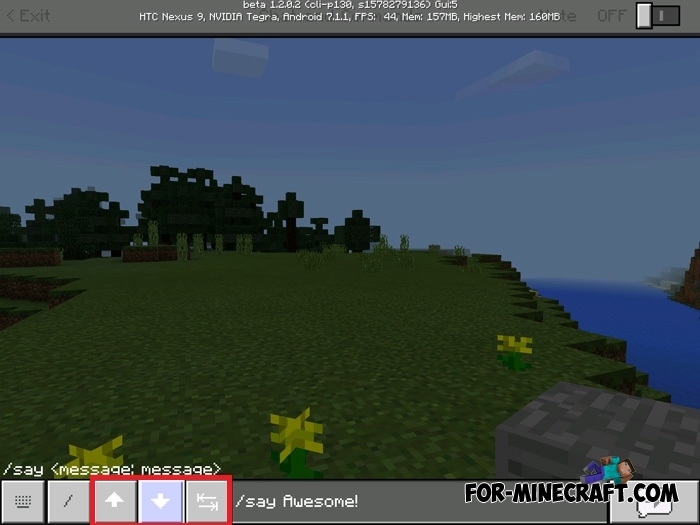 The addon only works on Minecraft PE 1.2 for Android, iOS version will appear after the beta testing of the game.